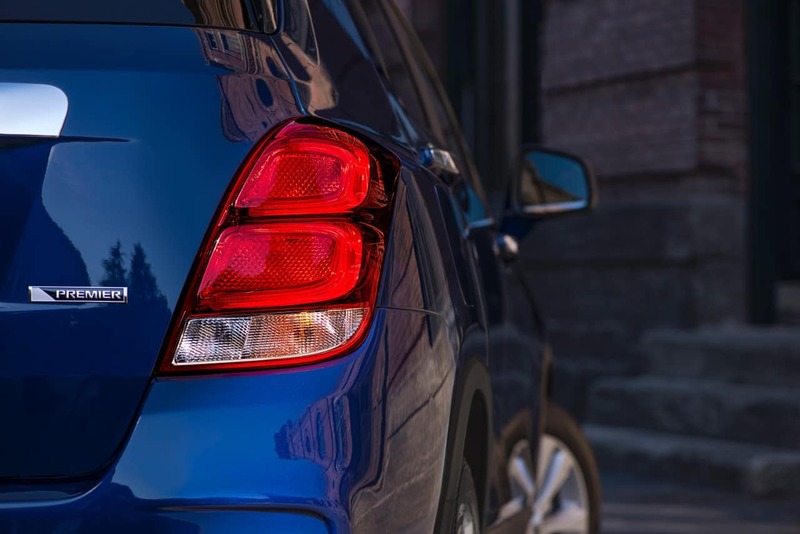 Introduced for the 2013 model year, the Chevrolet Trax is currently the smallest SUV that Chevrolet produces. On February 12, 2016, Chevrolet introduced the vehicle with a mid-cycle update. The 2017 Chevrolet Trax, which represents the nameplate’s fifth model year, is available as an LS, LT, and Premier trim. A cross between the SUV and hatchback bodystyles, the 2017 Trax uses design elements from its larger siblings: the Malibu and the Volt. The result is a sleeker, less bulky-looking exterior profile. Halogen reflector headlights with automatic lamp control and sculpted taillights form the base-level exterior lighting. On the LT and Premier, the reflector headlights are replaced by projector ones, and halogen bulbs are swapped with longer-lasting LED ones. Also, the Premier has the addition of front fog lights for enhanced illumination. The side mirrors can manually fold and are power-adjustable, and they get heated capability if you go with the LT or Premier. Also added on the LT and Premier are deep tint on the glass for an extra layer of privacy, roof-mounted rack side rails for additional cargo carrying capability, and a skid plate for protecting the undercarriage. The LS rides on 16-inch steel wheels, while the LT and Premier get 16-inch aluminum ones. The 2017 Chevrolet Trax is designated as a subcompact crossover SUV, with seating for up to five people. 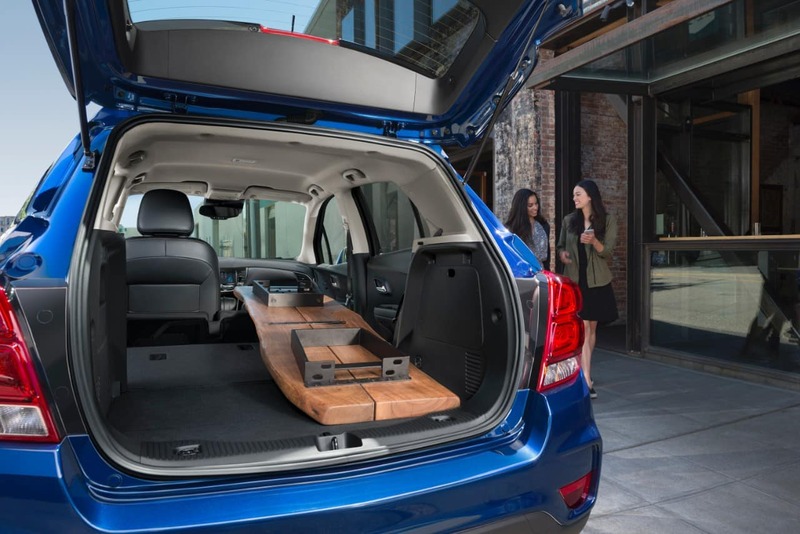 The rear 60/40 split-bench seat enables you to expand cargo volume to 48 cubic feet from the trunk. At the base level, all seats have cloth trim, and front seating in particular consists of a 4-way manually adjustable driver’s seat and a 2-way manually adjustable passenger seat. On the top-level Premier trim, cloth trim gives way to leatherette, and the driver’s seat is 6-way power adjustable. Amenity-wise, the 2017 Trax starts with steering wheel-mounted controls, remote keyless entry, and a built-in Wi-Fi hotspot that permits you to browse the Internet at 4G LTE speeds. The six-speaker infotainment system includes Bluetooth connectivity, voice activation, Apple CarPlay and Android Auto for smartphone-based control (new for this model year), two USB ports and one auxiliary jack, and a 7-inch color touchscreen. Upgrade to the LT to add a three-month complimentary SiriusXM satellite radio subscription, electronic cruise control, and a remote vehicle start system. 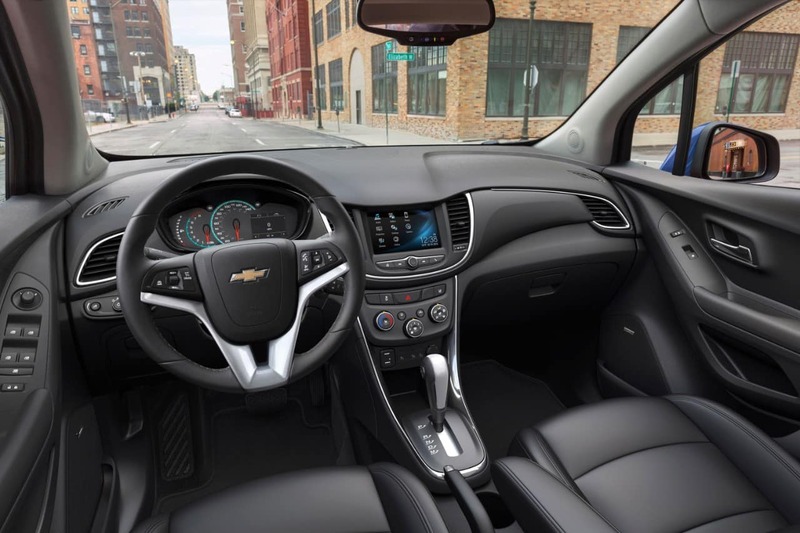 On the Premier, Chevrolet replaces the six-speaker audio with a seven-speaker Bose premium sound system, and there’s auto dimming ability on the rearview mirror to tame headlights that flash from behind you. As part of the mid-cycle update, the Trax gets a new dashboard and center instrumental panel, which includes a 3.5-inch monochromatic driver information center. On the 2017 Trax, you get to choose between a front-wheel drivetrain and an all-wheel drivetrain. With front-wheel drive, you’d get a front-disc and rear-drum brake layout. With the all-wheel drive system, not only would you get enhanced traction capability, but you’d also get an upgrade in the brakes, as the rear drums are replaced by discs. Thus, it would be quicker for the Trax to come to a stop when applying the brakes. The SUV’s electric speed-sensitive power steering provides more steering assist during low-speed maneuvering and less power assist when cruising down the highway and want better road feel. Turning speed with the power steering system is 35.5 feet on the LS and LT and 36.8 feet on the Premier. The 2017 Trax is powered by the 1.4-liter turbocharged ECOTEC engine, which generates 138 horsepower at 4,900 rpm and 148 lb-ft of torque at 1,850 rpm. It is linked to a 6-speed automatic transmission, which is electronically controlled for a smooth driving feel. 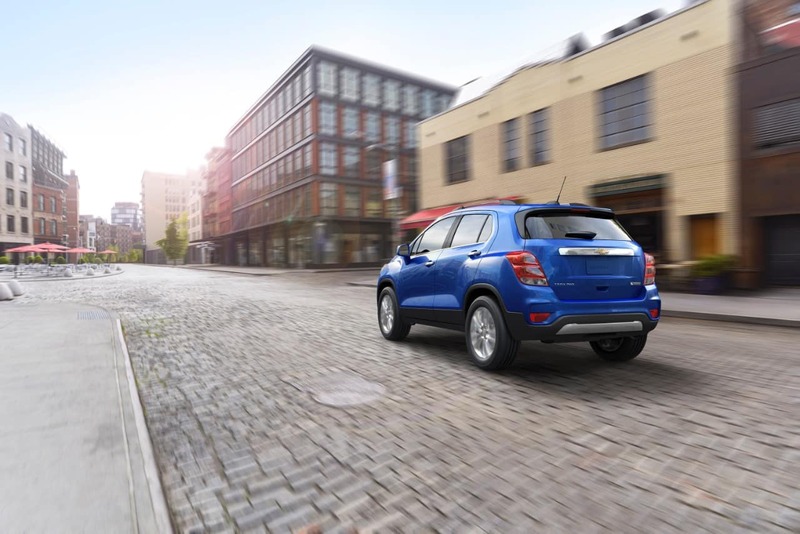 Fuel economy on the new Trax is measured at 25 mpg in the city and 33 mpg on the highway. The 2017 Trax has ten airbags. Two function as front impact ones, and they face the driver and front passenger. Also facing the front occupants are a pair of knee airbags. Dual airbags are mounted on each row for side impact. And side curtains are mounted on the roof rails to flank both rows of seats. Monitoring the front passenger seat is a passenger sensing system that governs the activation of the airbags based on the weight or age of the occupant. 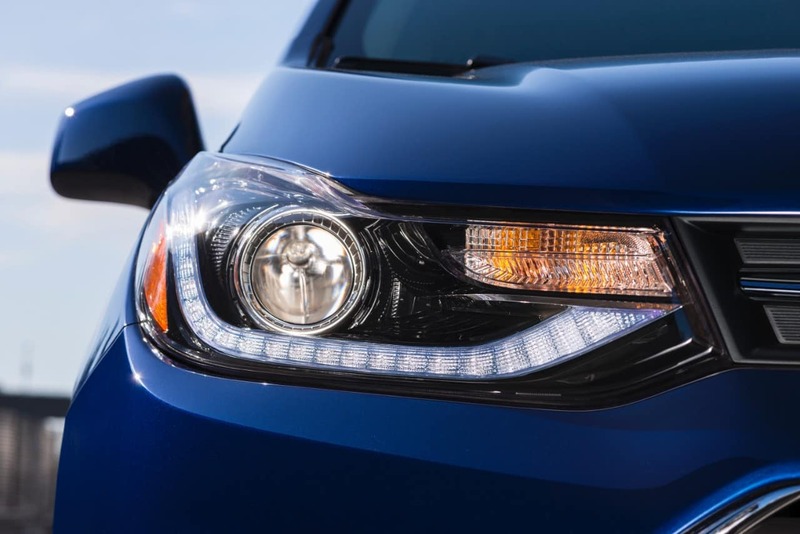 Daytime running lamps are included on the headlights to increase conspicuity, especially in the dark. On the LS, the bulbs are halogen; they are LED on the LT and Premier. The Trax has a pair of OnStar trial subscriptions: a five-year Basic Plan that includes vehicle diagnostics and dealer maintenance notification; and a more robust but much shorter Guidance Plan, which provides a period of three months in which you have access to services like roadside assistance, emergency assistance, turn-by-turn navigation, and automatic crash response. Also standard on the Trax are electronic vehicle stability and a rear vision camera. The Premier has advanced safety features such as side blind zone alert, rear park assist, rear cross traffic alert. For Fox Lake IL Area 2017 Chevrolet Trax in the Fox Lake IL Area, contact Libertyville Chevrolet today. As a Chevy Trax dealer based in Libertyville, we have been serving Fox Lake Illinois and other towns and cities in the Chicago metro area with quality Hyundai vehicles. 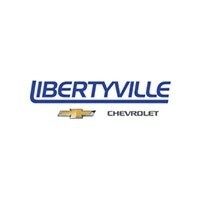 Contact Libertyville Chevrolet today for Fox Lake IL Area or Fox Lake IL Area 2017 Chevrolet Trax. 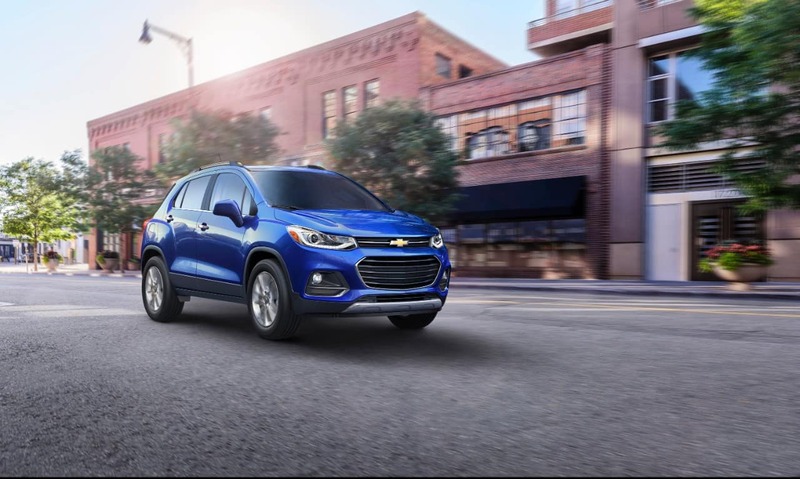 One of our sales specialists serving Fox Lake Illinois will be more than willing to assist you in getting into the 2017 Chevrolet Trax of your own specifications.